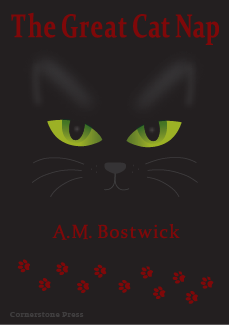 You are invited to the book release party of The Great Cat Nap by A.M. Bostwick and published by Cornerstone Press. This event is Thursday, Dec. 12, at 6:30pm at the CPS Cafe on the campus of the University of Wisconsin, Stevens Point. I’m going to be there, and I hope you will too. Come, bring a friend, buy a book, listen to the author talk, eat some cookies—it’ll be a lot of fun. I’m lucky to have the author with me on today’s blog. The A in A.M. Bostwick stands for Abigail. Welcome, Abigail! Abigail: Thank you for having me, Elizabeth! Elizabeth: Tell us about your book. Abigail: The Great Cat Nap is a middle grade novel, all told from the point-of-view of a cat. Ace is the feline companion of an editor at a small town newspaper in Lakeville, Wisconsin. When famous show cat, Ruby the Russian, goes missing, Ace is on the story. But Ace bites off more than he can chew when he agrees to play amateur detective and find the lost show cat. Ace has to call on his feline friends, a few dogs, and even a couple bad-tempered rodents in an effort to solve the case. He’ll need to break a cat out of the pound for priceless information and fight a single-pawed battle with animal smugglers to get answers! Ace likes his milk neat, and his jelly donuts thick with icing. My hope is that this book will appeal to not only adolescents, but mainstream mystery readers, feline and animal enthusiasts as well as adventure lovers. Elizabeth: Where did the idea come from? Abigail: Well, I’ve always been an animal lover. Some of my earliest memories involve cats or dogs! And some of the first stories I ever wrote as a child were about cats. When I first sat down and seriously tried to write a book, I wanted to have fun with it. I wanted to escape. 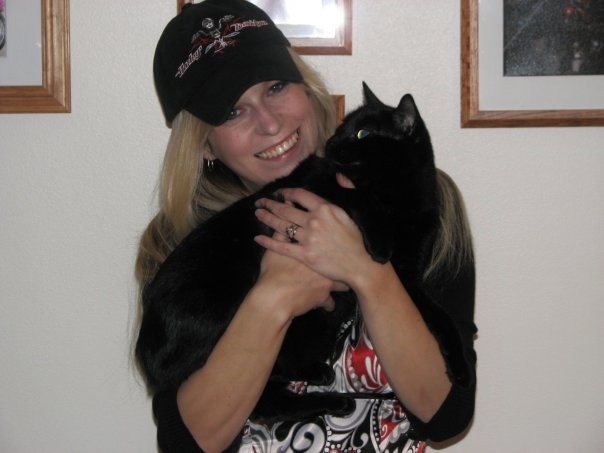 I drew on my experience as a lifelong cat owner (my own black cat, Boots, inspired Ace) as well as my years as a newspaper reporter to write this novel. Elizabeth: Did you have to do much research to put the story together? Abigail: Not a lot! I already knew a lot about small town newspapers, politics, hard crime and felines! Not to mention dogs and their relationship with cats. After that, it was a lot of creativity and imagination – thinking about how a cat might react to situations differently than a human might, how their relationships work to humans and animals and what they would do if they had strong motivation to solve a problem. Elizabeth: Is this your first experience being published? Abigail: It is! And it is so thrilling! Elizabeth: Have you written anything else? Abigail: I have. I began writing as a child. I’ve always been an avid reader and a writer. Earlier this year, I submitted my first manuscript to agents. I signed with a great one, and am currently working on revisions for a young adult novel to be submitted to publishing houses in 2014. Another novel I wrote earned an award in a contest from the Wisconsin Romance Writers of America earlier this year. As a writer, Ace was my first character, though The Great Cat Nap was not the first novel I wrote. The first novel I wrote was terrible! However, it taught me a lot about not only the writing process, but MY writing process. Abigail: Staple myself to the chair! I do my best writing in the early morning, usually at my office desk or with my laptop on the sun porch in summer. Getting into my character’s heads is one of my favorite things about the writing process. I spend a lot of time trying to understand what they want, what drives them. Seeing the world through their perspective. I do love characters who get into trouble! I also read a lot. If you want to learn to write, I feel you need to read. And read everything – the great, the good and the bad. Take it apart, find what works and what doesn’t. Elizabeth: What can you tell me about working with the student-run publishing house Cornerstone Press? Abigail: It’s been fabulous! I can’t tell you how much it means to have my first-ever novel published by the very university that I graduated from. It’s been a real honor, and so humbling to have my manuscript chosen out of so many. The students and staff have been so supportive, encouraging and wonderful to work with. A real class act. Elizabeth: Enough about your book, tell us about yourself. Abigail: I’m a writer, reader and a runner. Besides writing, my other love in life is art. I also adore animals, and spending time with my family and my friends. I live in the Northwoods of Wisconsin where I am an occasional contributing writer for the Tomahawk Leader and live with my husband, dog and thrill-seeking cat. Abigail: Depends on my mood! Abigail: Goodness…depends on my mood! Again, I love both! If you’d like to learn more about Abigail Bostwick and her The Great Cat Nap, come to the book release party: Thursday, Dec 12, 6:30, CPS Cafe, UWSP. You can order copies of The Great Cat Nap from Cornerstone Press or buy them at many central Wisconsin bookstores. Contact Abigail at Abigail.bostwick at gmail.com and follow her on Twitter at @bostwickAM. Don’t forget: Come to the book release party for Abigail Bostwick’s The Great Cat Nap: Thursday, Dec. 12, at 6:30pm at the CPS Cafe on the UWSP campus.